After a painstakingly slow first half, the story shifted into high gears and started to get a lot more interesting. 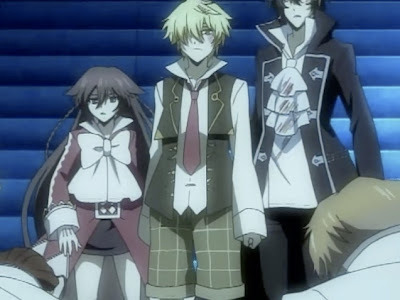 While browsing the Internet, I ran across quite a few reviews that considered Pandora Hearts to be disappointing. I can sort of see where they're coming from: it was somewhat frustrating to sit through the first half of the series. Having said that, however, with a set up as complicated as this, I can't really think of another way that is better than what they have done to lay it out. So if you have gotten past episode 12 and thinking of dropping it (which I did at one point), DON'T. It's going to get a lot more interesting soon. Compared to 07 Ghost and Suzumya Haruhi 2 this anime is doing fine. Yes the story did have a slow start but it was worth the wait. Iwasn't fond of how they try to make some questions and then leaving it unsolved for a long time. Even when Oz himself questions about it, another event comes up when the question is totaly forgotten and is never asked again. After finished watching episode 17, I really think Pandora Hearts is a much better story than it appears to be at the moment. As for the two references you mentioned, I still haven't gotten a good grasp on the big picture of 07 Ghost yet. And Suzumya Haruhi 2, whoever produced it needs to be shot. agreed on the Suzumya Haruhu 2 statement. I have seen episdode 15-17 now and i'm relly getting excited about the story, they put a healthy portion of mystery in it combined with humour what have been almost every time a winning formula.